1800Baskets.com Exclusive! Send someone who’s especially sweet a gift of gratitude and good taste! They’ll love this sturdy gift box filled with fruit and sweets, including a juicy Comice pear, a succulent Fuji apple, sweet and crunchy lemon crème almonds, caramels and frosted sugar cookies in the shape of a gold star and a Thank You square, plus more! 1800Baskets.com Exclusive!Send someone who's especially sweet a gift of gratitude and good taste! 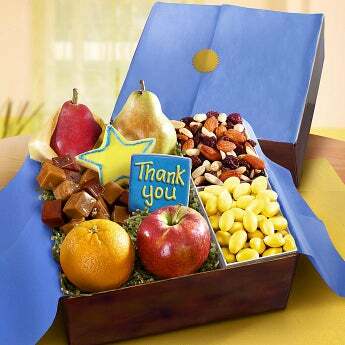 They'll love this sturdy gift box filled with fruit and sweets, including a juicy Comice pear, a succulent Fuji apple, sweet and crunchy lemon creme almonds, caramels and frosted sugar cookies in the shape of a gold star and a Thank You square, plus more!